When two of the worst outside shooting teams in the country get together, well, you get what Syracuse and Georgia Tech did. The two teams combined to shoot 30.3 percent from the floor in the game, so it only makes sense that an bricked three-pointer and a deflected putback attempt gave the Orange (10-4, 2-0 ACC) a 46-45 road win over the Yellow Jackets (9-5, 0-2). A pair of Rakeem Christmas free throws gave SU the lead with 12.4 seconds to go and their defense made it stand up. There are a lot of stats that back up the ugly offensive nature of the game. Syracuse shot 34.6 percent from the floor on the night, but held the Yellow Jackets to 26.3 percent shooting in the game, including a brutal 17.2 percent (5-of-29) mark in the second half. GT at least did the proper thing with all those missed shots, chasing down 19 of them to power their 43-33 rebounding advantage. Georgia Tech, who came into the game with the worst three-point shooting percentage in Division One, did nothing to change that status. The Orange held them to 3-of-17 from beyond the arc. In contrast, Syracuse made 4-of-9 from deep, making it the sixth time in their last seven that SU made at least one third of their attempts from three. 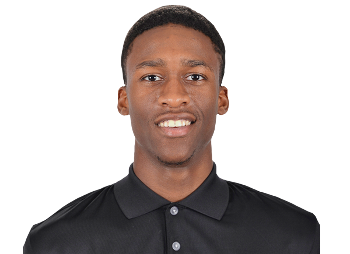 In what would be an omen of things to come, Kaleb Joseph, Michael Gbinije, and Trevor Cooney all missed lay-ups in the game’s first three minutes. Fortunately for the Orange, Gbinije stuck an open three off the left wing for a 3-0 lead. It was the only made shot in nine tries by SU to open the game and Georgia Tech took advantage, scoring seven straight points to lead by four. Syracuse snapped out of the cold shooting with their own 7-0 run. Cooney started the burst with a fadeaway jumper. Gbinije drilled an open pull-up off the break to tie the game, then got wide open for three when Rakeem Christmas was doubled in the post and cashed in a nice kick out pass to make the Yellow Jackets pay. The trey boosted SU to a 10-7 lead with just under seven minutes elapsed. Georgia Tech scored six of the game’s next eight points, taking a 13-12 lead on an emphatic slam dunk in transition. The Orange grabbed the lead back on their next trip when Patterson found Christmas’ defender on the ground and passed it to the big man for a two-handed stuff. The Yellow Jackets went on an 8-3 run to match their biggest lead to that point at 21-17. Christmas immediately cut the gap in half with an awkward-looking, but effective, lefty hook. After missing a three on the next SU possession, Cooney atoned for his misfire, drilling a triple in transition to put the Orange in front, 22-21. A three-point play put GT back on top, but the Orange got out on the break again. Joseph came down with a long rebound and pushed the ball downcourt, eventually setting up Gbinije for a dunk off a pretty hesitation dribble. The baseline slam tied the score at 24. Georgia Tech got the next three points, but a pair of free throws from Christmas made it a one-point game, then he drained a 17-footer on the final possession of the opening half for a 28-27 Syracuse lead at intermission. Both teams started the second half slowly with Tech getting on the board first. SU matched the score when Chris McCullough stole a pass and the change of possession resulted in Gbinije finding a wide-open lane to the bucket for a lay-in. McCullough would add a leaner a couple minutes later to break a tie and give SU a 32-30 lead almost six minutes into the second half. The two squads traded scores until just after the midpoint of the half, only the hosts got a three-point play and a trey for a 38-37 advantage. They then added another triple to take another four-point lead. Cooney wiped out most of the gap when Gbinije collected a long offensive rebound and found the SU deep threat for a triple. Neither team scored for nearly three minutes, but Tyler Roberson came through for Syracuse, using a shot fake to create daylight on the left baseline and drive for a reverse lay-up and a 42-41 Orange lead. On the next SU possession, they made it seven straight points when Patterson drove the right side and fed Christmas for an emphatic two-handed slam with just over 4:30 on the clock. That, however, would be the last field goal for Syracuse. Georgia Tech dropped in a couple foul shots on their ensuing possession to claw back within 44-43. Neither team could score for a couple minutes. The dry spell was not without highlights, as Gbinije made a dramatic block of a dunk by a wide-open Georgia Tech player to preserve the SU lead with two minutes left. The Jackets maintained possession, however, and eventually converted with a pair of free throws for a 45-44 lead with 1:23 on the clock. 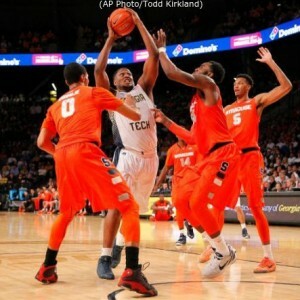 Gbinije missed a stepback 18-footer on the next Orange trip and Georgia Tech secured the rebound. Their three-pointer against the clock drew nothing but backboard and the resulting shot clock violation gave Syracuse the ball with 28 seconds to play. Following a timeout, SU got Christmas open in the post and the big man drew a foul with 12.4 seconds remaining. The senior center swished the first foul shot, then, following a time out, did the same with the second, giving the Orange a 46-45 lead. Syracuse used a foul to give with 6.3 seconds to go. Pressed for time, Georgia Tech squeezed off an open three, which missed. 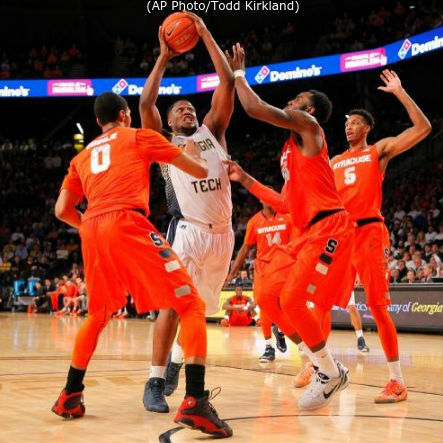 They got the rebound, but Gbinije deflected the ball, preserving the SU win. 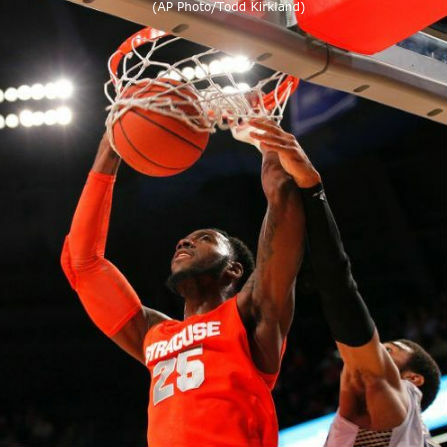 Rakeem Christmas was an offensive focus for the Orange all night and ended with a game-high 18 points. Michael Gbnije recorded his first career double-double, logging 14 points and a team-high ten boards. Trevor Cooney chipped in with nine points. Chris McCullough seemed particularly snake-bitten, finishing with three points on 1-of-7 shooting while several of his misses simply refused to be coaxed through the net. Charles Mitchell was a force for the Yellow Jackets, posting a double-double of 17 points and 11 rebounds. Marcus Georges-Hunt chipped in with nine points while Demarco Cox blocked three Orange shots. Syracuse returns to the Carrier Dome for their ACC home opener on Sunday when they take on Florida State. The Seminoles (9-6, 1-1) have won five of their last six outings, including an 86-75 home victory over Virginia Tech on Tuesday. Three players average double digits in scoring for FSU, led by Montay Brandon at 13.5 points per game. Aaron Thomas, who led the team in scoring to early the season at 14.8 points per game, was declared ineligible for the second semester and opted to leave school to pursue a professional career. For the second straight game, the Orange will face a poor perimeter-shooting team, as the ‘Noles are making only 27.5 percent of their threes as a team. Tip-off is slated for 8:00pm Eastern and, once again, ESPNU will televise the game. The contest will also be available online on ESPN3.com.